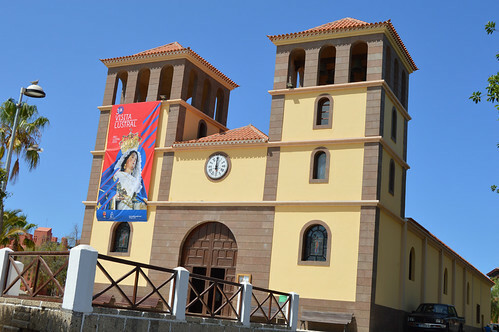 For most visitors to Tenerife, Fañabe means modern shopping centers and a lengthy golden beach but a little further west the old original town rises into the hills behind the bridge over the motorway. 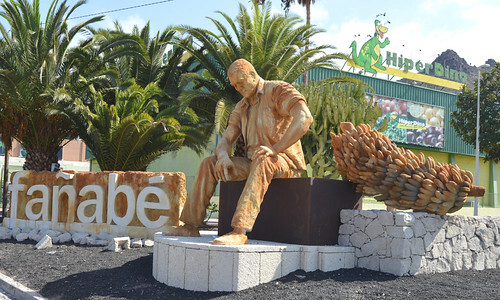 The sculpture is a recent addition and I have been itching to see it up close, sadly there are no details of the sculptor or subject ( possible a nod to Fyffes who brought commercial banana farming to Tenerife), just a very lifelike and kindly presence complete with a sleeve of bananas. Crossing the road bridge and heading down over the Barranco del Agua a large swathe of the cloth protected fruit spread down towards the coast, a small, tatty scarecrow stood on guard. 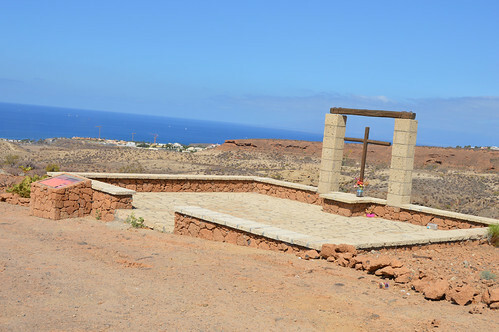 El Porton marks one end of the Camino de la Virgen, an important track allowing fishermen to get their catch up to Adeje town and when pirates showed up they were able to transfer the statue of the Virgen from the tiny La Enramada to the safer inland church of Santa Ursula. The track of the pathway is etched with the constant flow of the years and despite the modern intrusion of the motorway, power lines, and the five star hotels at the bottom end, it still has a comforting serenity. The old water channel has long since dried up but the tabaiba, and cardon plants still thrive and defy the bone dry old reservoir. 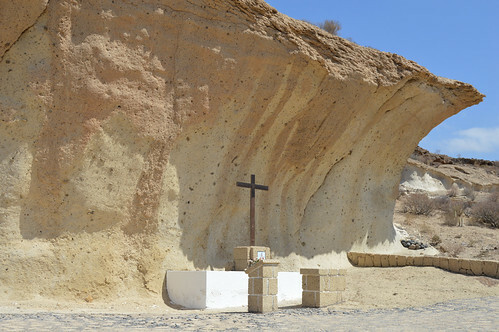 It’s just a 2 km stroll but several stop offs along the way are set aside for worship, La Tosca Colorada is the first on the way down, the big focal point is El Humilladero where a natural altar has been carved out under a limestone outcrop. 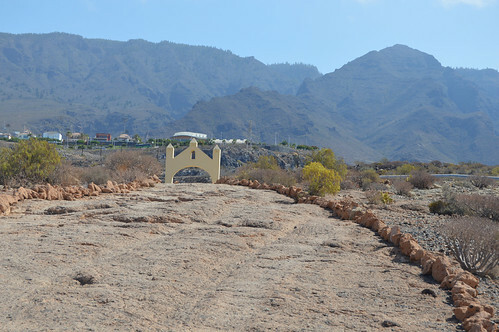 The second Sunday after Easter marks the big pilgrimage as the statue of the Virgen is taken down the route and onto the Playa La Enramada in La Caleta. Just across the modern main road at the bottom end is the old original church and it’s imposing modern replacement. I was greeted by a melodic peel of bells as the clock struck noon. 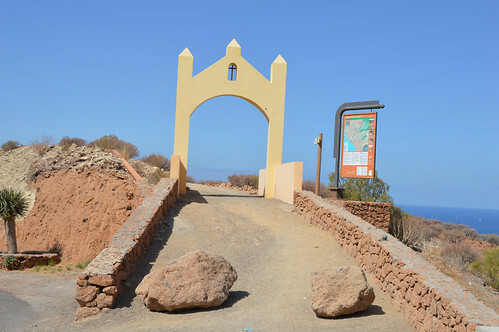 It’s quite a contrast from the modern tourist hotels to the pathway up to Adeje with the added attraction of Roque del Conde in the distance. I was very pleased with my short journey and I’m sure the banana loving sculpture at the other end will still have his benevolent smile next time I see him.